Danatronics offers our EHC-09 Color Wave series as the top of the line gages for corrosion applications. The EHC-09 Color Wave offers many standard and practical features including a sunlight readable color display with live A-Scan, echo to echo to ignore coatings, B-Scan, 100K thickness reading datalogger with interface to Microsoft excel. The Color Wave is available in 4 models including the EHC-09C, EHC-09DLC, EHC-09CW and EHC-09DLCW. The vibrate on alarm is a world’s first and is great for loud environments! The EHC-09 Color Wave series is available in 4 models to suit your every budget and application. Includes all the features of the EHC-09C plus a live color waveform (A-scan). (No Datalogger) with the live waveform, you can adjust range, gain, blanks and rectification. Protective Pouch: Custom molded pouch with belt clip and wrist strap for either lefty or righty operators (optional, standard with DLC and DLCW). This option allows for the coating or paint thickness to be ignored. The coating thickness or paint does not make the substrate material any stronger. Without the ability to subtract the paint, the normal measurement would introduce an error of 2 to 2.5 times the thickness of the paint, which represents the sound speed difference from Paint to Steel. This option is only available combined with the Datalogger option. Provides a non-encoded (time base) or a cross section (side view) of the part being inspected. The image above shows the side view of a step block. The operator can scroll where the cursor line is after a B-scan is generated to get the thickness value as that point (.100”) shown above. The EHC-09 Datalogger stores up to 100,000 readings in it’s internal Datalogger as linear, 2D, 3D or boiler in alpha numeric or 2600 waveforms (if gage is equipped with waveform option). Thickness values along with the i.d. information and all gage set up parameters are exported to Microsoft excel via the no-charged, included Data XL interface program provided with every Danatronics thickness gage. Our Datalogger also interfaces with Ultrapipe. Please contact Danatronics for more details. 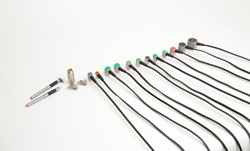 (Datalgger: included with all DL gages, also available as an add on for all EHC-09 series). We offer a custom protective pouch Part Number PP-09 for the EHC-09 Series. 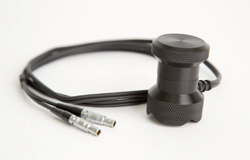 This Dual lemo to microdot adapter is required when using a delay line or pencil probe with our EHC-09 series. With this hardware upgrade, the EHC-09 can be used with AC Power (please note, this is not a re-charging system). In other words, with this option, the EHC-09 can be either used with AC or battery mode.